This movie shows the progression of NASA's NEOWISE survey in the mission's first year following its restart in December 2013. 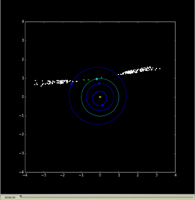 Each dot represents an asteroid or comet that the mission observed. Green circles represent near-Earth objects (asteroids and comets that come within 1.3 astronomical units of the sun; one astronomical unit is Earth's distance from the sun). Yellow squares represent comets. Gray dots represent all other asteroids, which are mostly in the main asteroid belt between Mars and Jupiter. The orbits of Mercury, Venus, Earth, and Mars are shown. During that year, NEOWISE discovered and characterized 40 near-Earth objects and observed 245 previously detected near-Earth objects. For more information about NEOWISE (the Near-Earth Object Wide-field Survey Explorer), see http://neowise.ipac.caltech.edu. NASA's Jet Propulsion Laboratory manages the NEOWISE mission for NASA's Science Mission Directorate in Washington. The Space Dynamics Laboratory in Logan, Utah, built the science instrument. Ball Aerospace & Technologies Corp. of Boulder, Colo., built the spacecraft. Science operations and data processing take place at the Infrared Processing and Analysis Center at the California Institute of Technology in Pasadena. Caltech manages JPL for NASA.